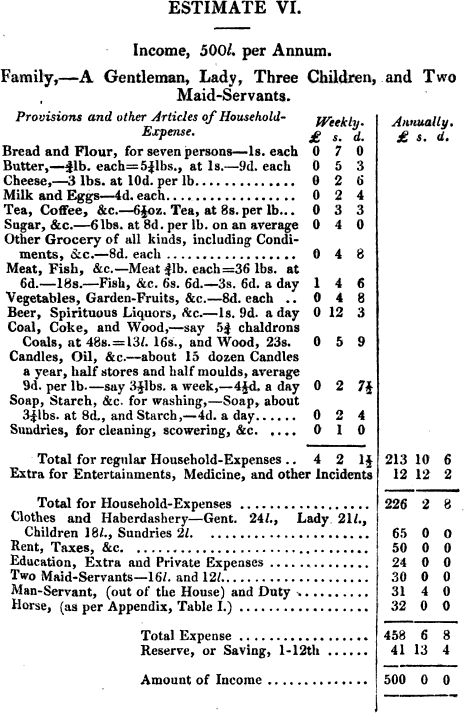 The following lists of incomes and expenditures can be found in A New System of Practical Domestic Economy, published in London in 1823. 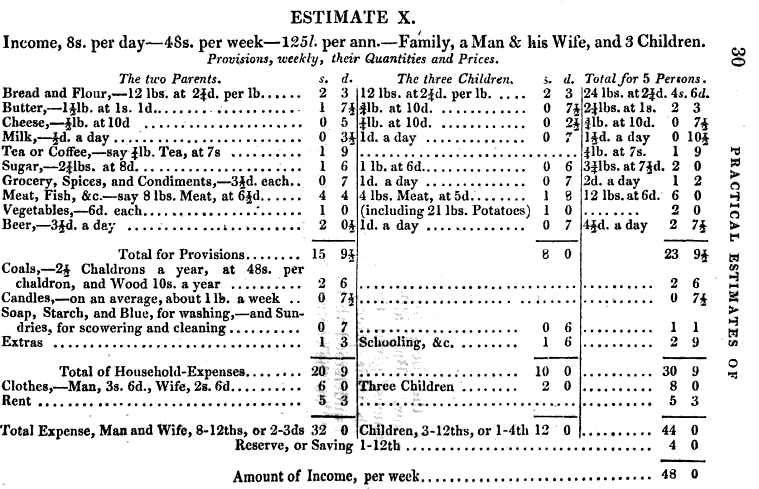 The book contains more estimates than the ones below. I removed the estimates that I felt were redundant thus upsetting the numbering sequences. Sorry. The estimates increase per annum income. The final list is for an income of 5,000 pounds per year. That was about Mr. Bingley’s income in Pride and Prejudice. Mr. Bennet’s was 2,000 pounds. 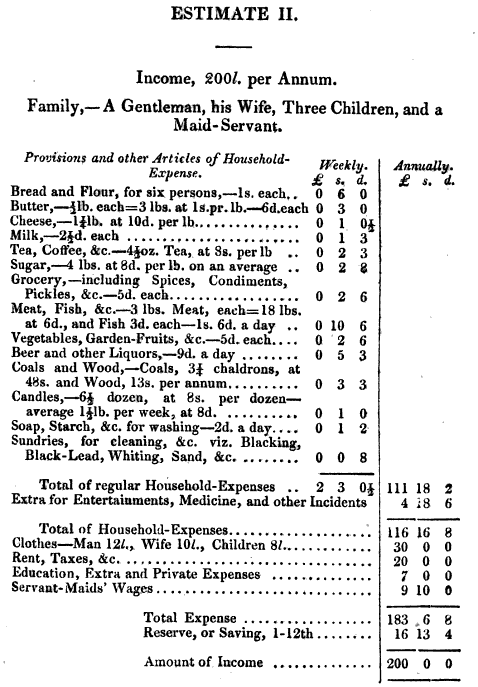 “Respecting Bread, which is the principal‘article of consumption in families of the middle classes, we have founded our calculation on the present price of sound household bread in London—namely, from seven farthings to two pence farthing per pound: but this is more than the average price in the country. There, too, barley, rye, or oaten bread, is generally eaten in such families, many of whom, also, bake their own bread, which is a considerable saving; so that our Estimates may be too high for the country, which, however, is an error on the right side. But respecting this and other articles of food, we have made it a point to be as correct, and as generally applicable, as it is possible to be. 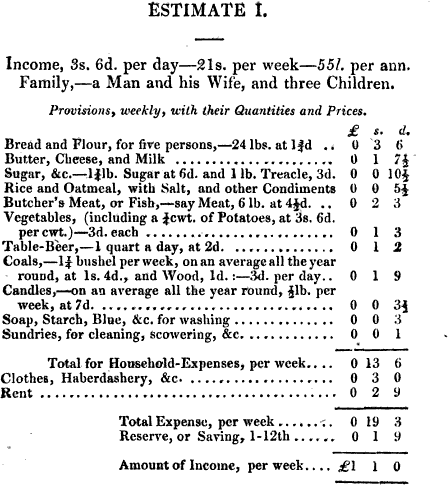 As to the quantity of bread stated, we consider it as fully sufficient The two adults cannot eat more than six pounds each, per week, and we consider the three children as consuming as much as their parents—that is, six pounds more; but should ‘ not this, in any case, be enough, as the income will not afford more, recourse must be had to potatoes, rice, oatmeal, and other wholesome and nutritive articles of food for the children, which will save bread, and should be constantly given to them, as proper and economical substitutes for this and other expensive articles of diet. It is better to buy large loaves than small ones ; and the loaf should not be out till it is one day old. 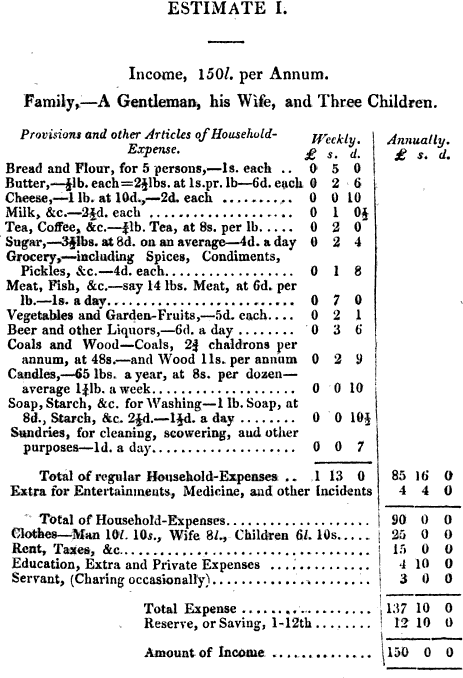 Tonight, I’m excerpting from a fun little volume titled The (Thorough-bred) Poor Gentleman’s Book; or, How to Live in London on £100 A-year, published in 1835. As usual, I can’t find many images of fashionable men doing fashionable things without spending hours digging through archives. And I’m too lazy for that. 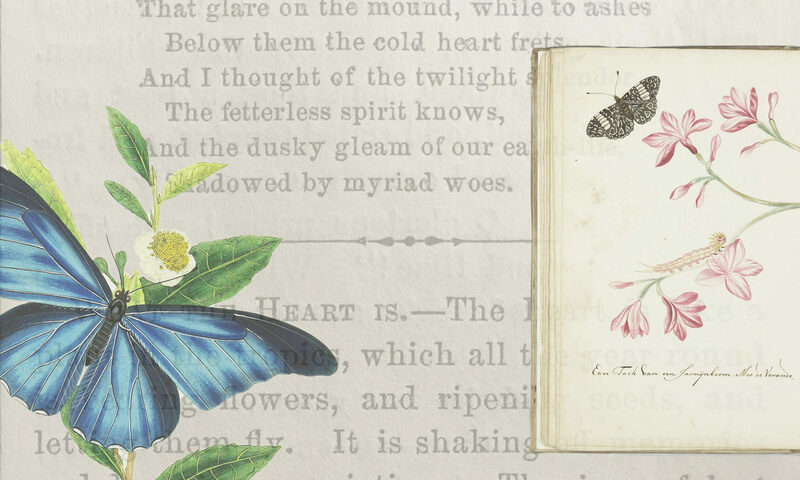 You can click on the meager images in this post to link to their original journals or books. Never ask a favour (of a solid kind). Never be in debt sixpence. Never make up to richer people first; let them pass, whether in a carriage or on foot, if they do not see you, and nod first! Refuse some invitations now and then of your best friends. Never get into a cab or hackney-coach when you can possibly walk. Buy no trifle you do not absolutely want. Don’t lounge at pastrycooks’ eating cakes or soups. Don’t smoke or snuff, or glide into any expensive and foolish habit; that leads to no good. Never accept dinners at hotels from other single men, when you can by any means get out of the scrape. 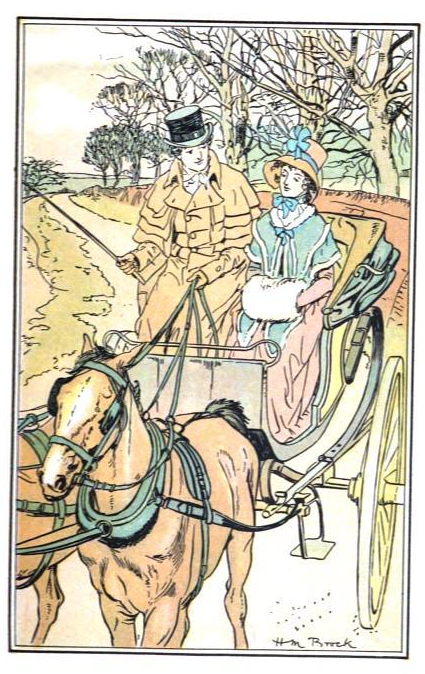 Carry halfpence in your coat-pocket: never be without a halfpenny—for a distressed silent woman; pass all other loud beggars, street-sweepers, &c.—”’tis just as generous as if the Duke of Devonshire gave a crown on such occasions! Never talk of rich titled people: if you do know any, keep it to yourself. Pay your tailor cash, and he’ll take off fifteen per cent, which brings the first rate nearly on a level with the herd of botchers: but cash must be paid for every thing as the grand rule on which all others hang. Never call a second time where your cards are not returned, unless on women, or the very old or infirm; let no rank be any exception; if you do, you will soon be cut more effectually! particularly where there are girls in the family. Never go near a hotel or a tavern, if you can help it. I will suppose you dropped from the clouds (of dust or rain ?) in the Circus, Piccadilly. Down go your portmanteau and bag. Recollect your hundred! Don’t go to a hotel; leave your luggage behind the counter of the office for two-pence, and start off for a lodging. Just behind Regent Street to the east, or north of Oxford Street, you’ll get a bed-room for seven or eight shillings; perhaps a parlour, with French bed, for half-a-guinea; that will do. Say you send your things at once, sleep there; giving a reference,—there is no difficulty. By this simple maneuver you save a seven or nine shilling bill, (nearly a week’s lodging !) Here lies the art of not spending your poor pittance foolishly. I should say, breakfast at home (You lose the whole morning if you don’t breakfast at home—which is detestable. If you are not too far off, return directly, at any rate.) if not, near the head of the Haymarket (there are others as good) is a decent coffee-room (Hope’s); go up-stairs; for five pence you have a roll and butter, and cup of coffee, put before you on a tray, with clean cloth, and in as good a room as more expensive coffee-rooms, with nearly all the daily and weekly papers (Pamphilion’s has books, but is crowded, in Sherard Street). Of course, you are not to know those who sit near you, though mostly decent people. You breakfast just as well in this way as if you paid two shillings, with a greater choice of papers. You give the girl a penny, instead of some waiter sixpence; and she, poor girl, thanks you more for it. There you may sit (if you bother your head about politics) all day, and read the millions of words pro and con, together with all the paid puffs, abuse, and nonsense of the weekly critiques on literature,—(“Literary Gazette,” to wit!) a busy feeble crew, who chatter as incessantly as the monkeys of the Brazils, with very little more intellect. Have you breakfasted badly? you will dine with the more appetite! From Dickens's "Sketches by Boz"
Now, where is a man to dine on five and-sixpence a day, where he may not be ashamed to be seen? How restore exhausted nature about five o’clock? Alas! there is no help for it, you must condescend to pop yourself (incog. !) into an eating-house. London swarms with these refuges of destitute dandies, clerks, shopmen, half-pay officers, &c. There is nothing to be ashamed of except talking loud, and giving yourself airs, and finding fault! all which things mark the well-dressed aping set I have already alluded to. Of course, you avoid notice, and get to some table quietly alone if you can. You have a great choice of plain, roast, and boiled of the second-best meat and vegetables. As you are hungry, a plate of beef or veal, and potatoes, put before you, is delicious; washed down with a pint of heavy wet:—why, it is a feast for the gods! what more would you have? A silver fork? soup, fish, wine? The first you may take in your pocket, for fear you should forget yourself at some friend’s; but it would perhaps look affected: the rest you can have, all tol-lol of their kind, and wind up with a slice of pudding, or tart, and cheese, &c. But you will extend your shilling (which pays for the simple dinner) to one shilling and sixpence, or two shillings and sixpence, possibly five shillings, if you attempt finery; and besides, it is in bad taste: better go to the Blenheim in Bond Street, or York in St. James’s Street, or the Union in Cockspur Street, at once. 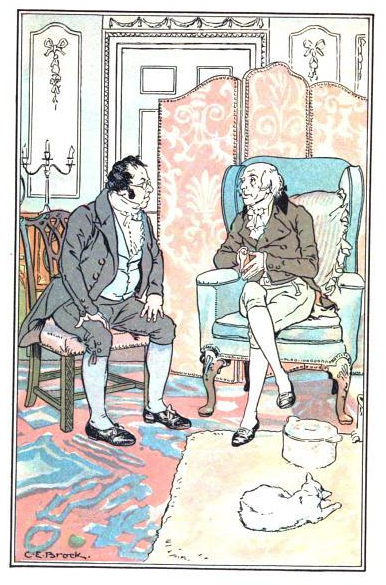 The worst of it is, on only one hundred pounds you cannot belong to a club, with propriety ! (Some men vegetate in boarding-houses;—but the cheap ones are dirty and skin-flinty; with a queer set of the “highest respectability. '”—the two guinea ones are a shade better;—bad are the best, town or country.) 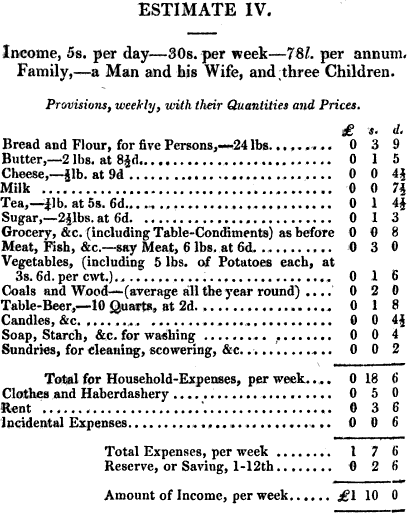 as you cannot well dine at the most moderate under three shillings and sixpence, besides your five or six guineas yearly subscription ; as at the Junior U. S. I will suppose you, poor fellow, a Sub. in the army or navy, or a Commander or Major: still, without private fortune, you must go to an Eating-house; and since there is no help for it, I will recommend you the best. If you come from the Park, go to the ” West-end Rooms” in Oxford Street, opposite Marsh’s; if from the Guards or East end, to the Shades’ Hotel, Leicester Square, half French. In Rupert Street, “John o’Groat’s” was good, but is spoiled, by affecting more and doing less! Men wait, and I prefer giving my two pence to the girls. There are a great many other houses of the same stamp scattered about, but as they stare a hungry man in the face at every turn, no need to enumerate them : another French house in Princes Street, close by: the York chop-house, Wardour Street, is the neatest and cleanest in town, and only two-pence more,—but at the worst of them a man can dine better (strange to say !) than for the same money in Paris ! (The city is full of eating-houses cheaper still! If a hotel man asks you “where you dine to-day?” always say “out;” and let no dashing fellow induce you to go to Vauxhall, or a Finish, or the Divans, or Shades, or Lush-houses, or Hells about Jermyn Street). 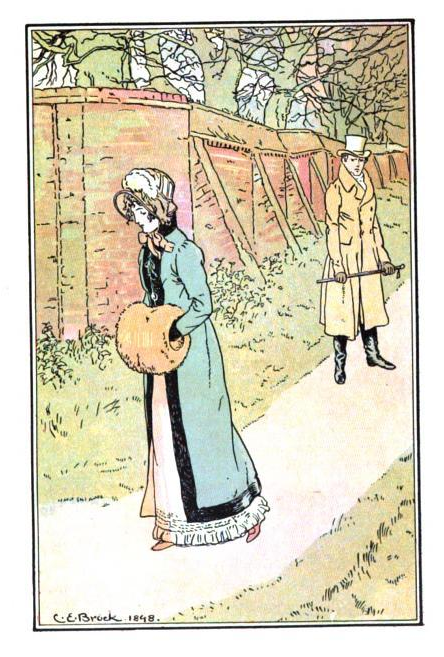 Thus, having dispatched this very indispensable affair, a man naturally looks round him how to pass his evening; for I will even kindly suppose he knows nobody in town, and never by any chance goes to a party, dinner, or dance. Of theatres there are twelve or thirteen open every night; at half-price in the pit he may indulge himself now and then, when there is anything worth seeing. Concerts, and the King’s Theatre, while they are pitched at half-a-guinea, I fear, are out of the question; but if he has heard and seen the same people abroad for a dollar, he may talk of them, now and then in a way, (should he be asked the usual question,—Have you seen Taglioni? heard Malibran, Pasta, Grisi, and Paganini ?) as to give to understand he goes occasionally: but this requires tact; if he has no ear he had better say nothing about the matter. Once or twice in the year he may indeed venture into Fop’s Alley, and judge how miserably deficient our Opera is, compared with the Academie or San Carlos. But how many tedious moments are there to be filled up in the twenty-four hours! each person’s taste and habit must manage in this as they please. Subscribe to Marsh’s Library, Oxford Street, or some other circulating library, for the novels, if any appear worth reading. Still there are Travels, Reviews, &c. always something new, to inform and amuse, besides the usual lounges in the Park about four and five o’clock, or along Oxford and Regent Streets; to Tattersall’s Mondays; to the Bazaar, Baker Street, on Tuesday and Saturday mornings; the Pantheon and rest of the bazaars (Adelaide Gallery, Colosseum, Picture Exhibitions, National Gallery, Surrey Zoological, Fancy Fairs, Dulwich Gallery (walk), Beulah Spa, Pantechnicon, &c.) at any time in the afternoon, when pretty girls may be seen in hundreds with their sweet faces, to contemplate respectfully: for I do not recommend that impudent and insolent stare, that compels a modest girl to hold down her head; nor is it indeed the interest of those knowing blades who display their taste and admiration in this very equivocal manner. Sometimes Regent’s Park and the Zoological attract a parcel of gay-looking people and equipages; they become more frequented every day! But of all the metamorphoses about town for the better, St. James’s Park is the most striking and admirable. 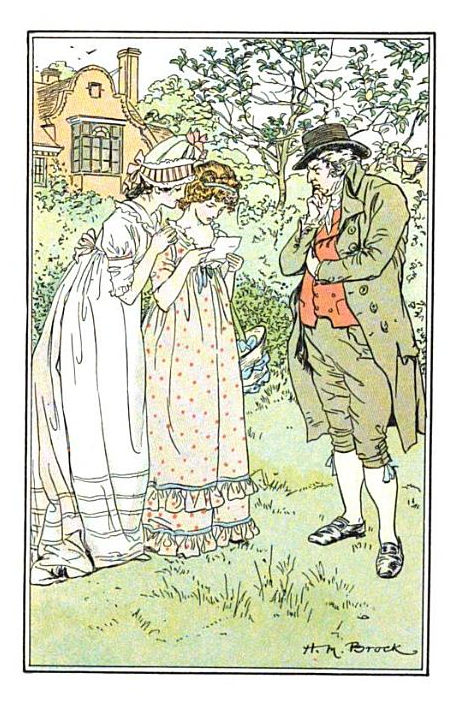 Here a man may take his book of a fine day, and seated (for a penny) beneath one of those noble elms near the water, fancy himself twenty miles in the country, and the grounds his own, with the additional pleasure of seeing groups of well-dressed people meandering along the paths, lending an interest to the fairy scene! We are in the habit of talking a great deal of common-place nonsense about London; but, in truth, there is no city in the world to compare with it for its riches, variety of amusements easily got at, its beautiful circumjacent walks and rides; St. James’s, Hyde, Green, Regent’s Parks, and Kensington Gardens; its noble streets, equipages, and the crowds of elegant people in circulation! In short, the minutest details are of vital importance: just as if the corner-stone of a building could be neglected or left out! down comes the whole fabric! 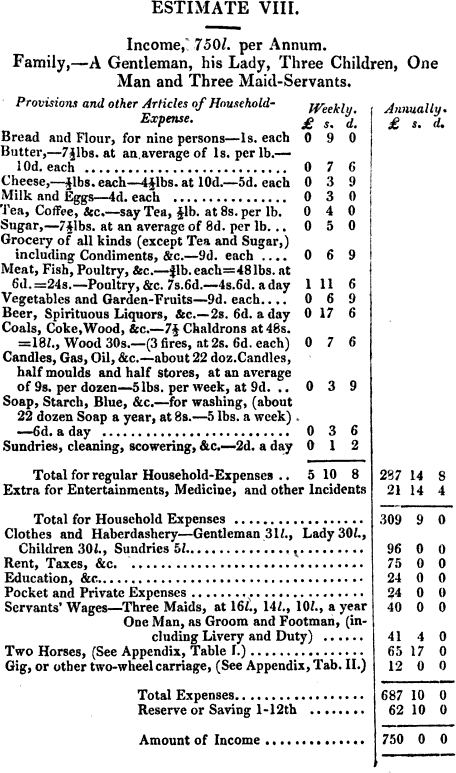 How many young fellows are there about town, whose bootmaker’s bill alone (not a word of the tailor !) comes to a third of your whole income !—whether it is paid or not is another matter. 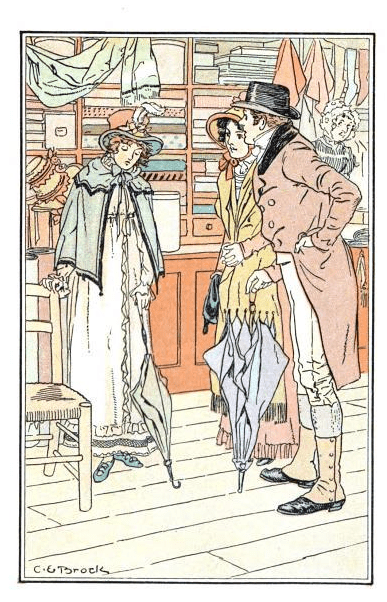 Allowing, therefore, fifteen pounds for your dress—and on this, I know, you can appear, not only as a gentleman, but well-dressed—you have eighty-five pounds left for living and lodging, and menus plaisirs. You cannot afford a sitting-room; and since it comes to that, have a cheap bedroom : one may always be got (not to be too far out of town) in that debatable region, between Tottenham Court Road and Regent Street,—or near the Edgware Road,—or where I have mentioned. Indeed, I once knew a young fellow hang out in Curzon Street on six shillings a-week; so that his address (he was never at home) was magnificent ! 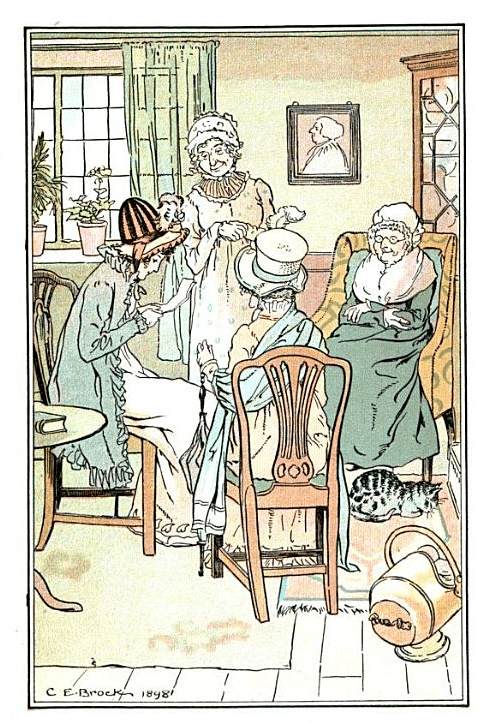 However, if your stock of philosophy is as slender as your purse, you must fee some hotel waiter to let you leave it, in Jermyn Street, or about the great squares; though there are many streets, such as Park, Great George, Green, Mount, Duke, Manchester, &c. where younger brothers of noble families have rooms, and where a poor fellow may obtain a bed, without being absolutely ashamed of the door, should a kind friend or two condescend to turn their horses’ heads that way. There is one comfort for a man of good connexions and family; the higher his friends and acquaintance are as to birth and rank, the less do they care about his lodging or his means: but beware of letting a parvenu know a bad address, or such people as are themselves struggling through a thousand meannesses and mortifications to get a step higher, or into the next circle above them; they would at once shake you off, without delicacy or ceremony. 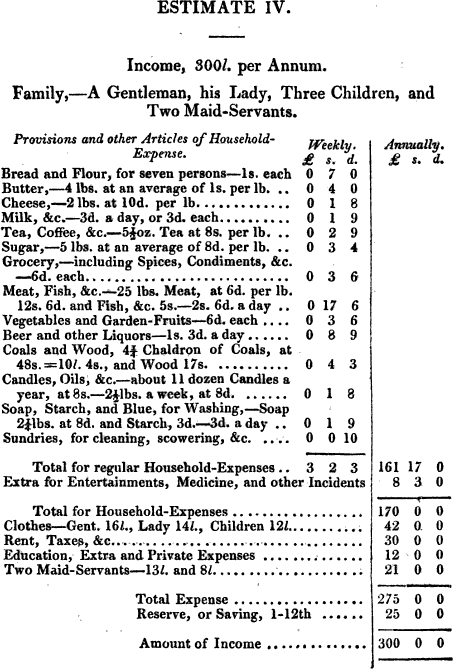 Enough of this.—Say your lodging comes to nine shillings a-week, (not to be too uncomfortable when at home,) and including a present to the maid-servant, will be twenty-six pounds a-year; and, for this shilling extra, you are always received and waited on with smiles. Always brush your own clothes, it does you both good! besides, one must not be troublesome! 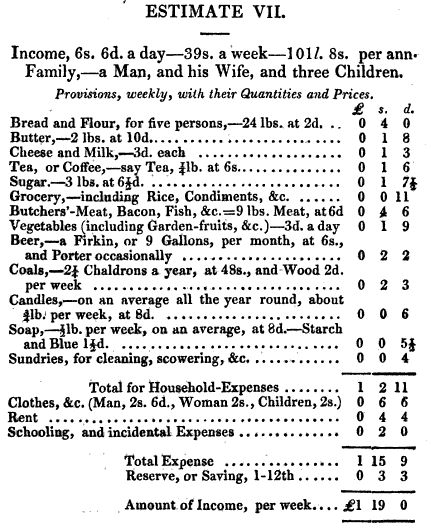 Three hundred and sixty five dinners, at fourteen-pence a-day,(a liberal allowance!) 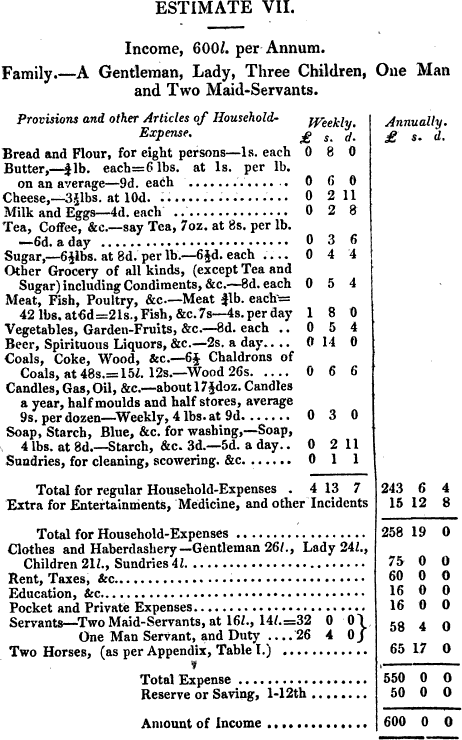 are twenty-one pounds, which leaves thirty-eight pounds; breakfasts, nine pounds five shillings, leaves twenty-six pounds fifteen shillings; washing, seven pounds; library, two pounds, as a sort of food he cannot do without; coals, the winter months, three pounds, added, leaves fourteen pounds fifteen shillings as pocket money for all contingencies! This seems a desperate small sum for extras and pleasures! having, with the most rigid economy, got over living, and clothing, and warmth. For though, as the poet says, asking very pertinently what riches give us? only food, clothes, and fire, yet, I confess, this account staggers even me, who have lived on much less, without descending to dirt or bad company ! Let us, looking to wealth, take any one nobleman whom you so much envy, for instance, in his cab, or taking a canter at five or so in the Park. Where, in the twenty four hours, shall we begin? He has, possibly, ten thousand pounds a-year: reputed incomes are all a bubble,—3,000l. means 1,800l., and 2,000. 1,200. 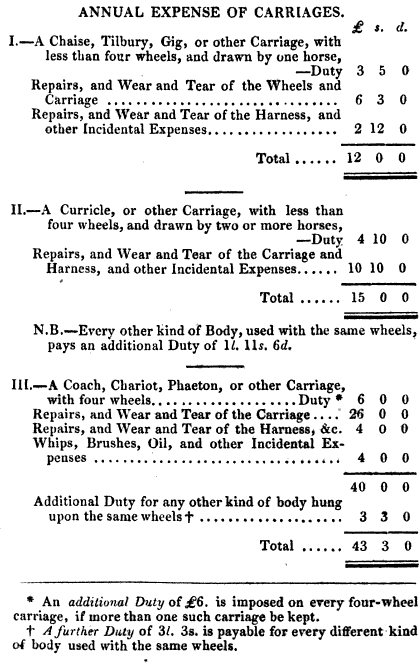 The poverty of fashionable families with a carriage on 3,000l. (granted) is pitiable, (hundreds have not a tithe of it.) Does this guinea an hour make him pass his time one bit more delightfully from its own weight? Not a jot, I suspect! He is tired of his cab, and horridly annoyed on seeing Booby Botheram with a more splendid turn-out than his; his reins were wrong, and his tiger was not so smart! He got home at seven to dress, tedious again: dines at home; they sit down very formally with some humble invite, as it is not one of their intimate days; how wearisome this formal politeness. He wishes the fellow (his wife’s cousin, or some scribbling critic) at the devil: they fly for refuge to the opera; too late for Pasta, Grisi, Malibran, Tamburini; Taglioni still pleases for a moment, spite of the tedium of repetition. The charm has lost its spring from being over-stretched: he yawns; nods across, and is bored by lookers-in, in some way or other; or he goes round himself to say ” How d’ye do?” to people he sees every hour! But suppose he passes a pleasing hour in a sly flirtation with a friend’s young wife, or some girl, whose eagerness for admiration does not care for his being married, as she hates his wife— perhaps an old flirt: this ends, he puts her in her carriage, and drops in at C—- ‘s, St.James’s Street, where he loses a thousand pounds, and goes home perhaps very philosophically, or swearing all the way; gets up next day at one or two, the weather heavenly; ay, but he knows nothing of the fresh mornings, —all is now dusty, noise, and bustle—the very thing for a town life: his wife persuades him to go and make a call or two with her; they see some pleasant people, and talk of music possibly, and get into a hot argument on Church Reform: away he comes, and gives his wife the slip at Howell and James’s for a lounge at the Alfred or U. S. club; takes up the papers; sees himself quizzed, perhaps abused; goes home in a rage, resolves not to notice it; dresses for a large dinner-party without curiosity, interest, or appetite. And thus his days drag on. Do you long for two hundred pounds a-year? the pleasure of asking a few friends to a coffee-house dinner now and then? or a better room’ where you could ask them? and more cash in your pocket for cakes, jellies, and ices? all this would not increase your enjoyments one tittle; nor would I advise you to alter your rigid economy as to “food, fire, and clothes,” if you have two hundred. On three hundred you can make noappearance more than on one. On four hundred, if you kept a horse and groom, you would be still the poorer; and so on. I went to the Opera last night, (you are not to suppose I have only 100l. a-year, if you please,) (Getting my eight-and-sixpenny ticket of Marsh, who has besides lots of private boxes at the Opera and Theatres to dispose of for a mere nothing! )and there, amidst a wonderful number of good-looking young fellows, all busy displaying their white kids, glasses, fancy waistcoats, nods to known boxes, &c. sat one close to me who, not having the fear of ridicule very closely defined in his mind’s eye, must needs do a little bit of what he thought the right sort of thing; so he takes me a small, slender, economical, ancient opera-glass out of his pocket, and with a marvelous—(by the bye I forgot gloves ! )—pair of dirty gloves on, did so be-eye all the lovely girls round about, that I was tempted to a smile in pity, as I myself was carrying on the same play of my opera double-barrelled gun, without however braqui-ing it point-blank at the pit tier, close to us, as my shabby friend did so unmercifully. To be sure, my glass was a superb “loup” carrying a golden shot to the opposite upper circles, while my poor third rate dandy’s was in sooth a most lamentable brass pop-gun. What malicious devils are we! Thus, of flash-houses (except the Tun in Jermyn Street), shades, cellars, finishes, Offleys, Gliddon’s, White Conduit House, and Stingo tea-gardens, and lush-houses, I know absolutely nothing. Neither do I of shooting-galleries, divans, or billiard tables. I do not exactly object to them on the score of their best customers not being the kind of people one meets in the best society (or very rarely), but because they are expensive; on 200l. a year a man might drop into these places now and then—even smoke a cigar, as that sort of thing is now tolerated;—and billiards is (for the bare pleasure of playing) a delightful game; why is it still so expensive? Tattersall’s is amusing; if you don’t bid! The Fives Court is dished! I always patronised sporting, and have walked to more than one milling match; but, it became a cunning trade in the fists of a few, lost its honesty; and is out of date: though it is worth while to look in at the lushing covies now and then at Spring’s in Holborn, and one or two others; they are a hearty, brutal set of fellows, but still, I hope, true Englishmen.